Are you looking to change the look of your home? You can customize your home with various aspects that can be easily replaced and changed in many ways; these include doors, windows, cosmetic changes such as (cupboards, tiles, fixtures etc). Cosmetic changes will only affect surfaces and does not change the structure of a place as having to knock down and rebuild walls. Before venturing into any form of renovation or home improvement, it’s always important to first assess your budget plan for the project. If you looking for wooden doors in Nelspruit, you’ll be pleased to know that there is a vast variety of doors manufactured in various types of wood. 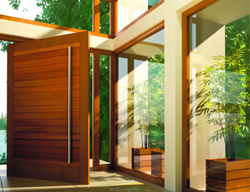 You can use wooden doors for both the interior or exterior of your home. They have good insulation properties and can give a home an overall grand appearance. Doors that are manufactured using wood can also be custom made to have a window embedded or different patterns in the door panels and lots more. Wood doors are available as hollow or solid core; however, solid core wood doors are generally more expensive than hollow doors. The colour you choose for the wood can be worked in to match the decor of your home. Wood doors are available in various types of wood and the type of wood and time incurred in the manufacturing process of the door can determine the price at the end of the day. Wood doors are generally robust in structure and as long as you treat the wood from time to time, it will remain beautiful looking for many years to come. Make your home look even more beautiful with Girelle’s range of fantastic wooden doors. Girelle supplies superb wooden doors in Nelspruit, including the high quality Swartland range. Apart from lush wooden doors, you can also select from a vast range of the best wooden windows Nelspruit offers. Wooden window frames can also do wonders at enhancing the look of your home. WHAT ELSE CAN YOU DO TO ADD THAT EXTRA SPARK TO YOUR HOME? Bespoke wood furniture is available in a wide range; from coffee tables, table tops, built-in designs, custom made beds, benches, chairs and sofas, stools as well as footstools, vanities, desks, dressers, dressing tables and furniture renovations. To have something custom made always adds that extra personal touch to the home and gives a sense of pride to the owner of the idea. If you have a large budget to play with, you can go as far as tearing down walls and structures in order to rebuild areas of your home. It is important to remember that it is not only the fixtures and structure work play an important role in making the home more attractive. Another vital fact to consider is aspects such as lighting and colour will do wonders in creating a sense of a bigger, cleaner space. So plan your renovation carefully in accordance with your budget to ensure you get the best results and home that you are proud of.